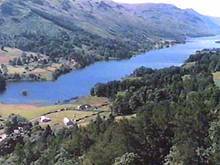 Geordie opens with a panoramic view looking west over Loch Voil filmed from the hill to the north of Balquhidder. 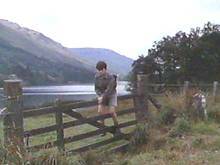 After the scenes in the schoolhouse Geordie climbs over the field gate near to the parking spot for Balquhidder Church, (the church is briefly seen later in the movie). The wooden field gate in the movie has now been replaced by a steel one but it's position is unchanged.